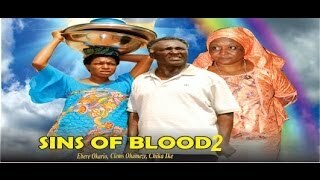 Sins of the Blood Nigerian Movie is the continuation of Sins of Tomorrow. The movie stars Clem Ohameze, Chika Ike, Ebele Okaro, Harry B, Mary Deus Onyemenam, among others. You are currently watching Part 1 of 2. Watch, comment and share with friends on your social network. Movie Synopsis: In this sequel to sins of tomorrow a series of strange events lead to making Ikem come in contact with a very rich man who Ikem helped, by returning his lost briefcase with millions of dollars in it.This rich man now introduces Ikem to vast wealth, but unknown to Ikem the man is very occultic. Ikem now has to pay a very high spiritual price to maintain his wealth. The film was directed by Nonso Emeka Ekwue and produced by Sunday Chibuzo Eriobu. Video streaming via YouTube courtesy Nollywood Pictures TV's channel.